Happy New Year! 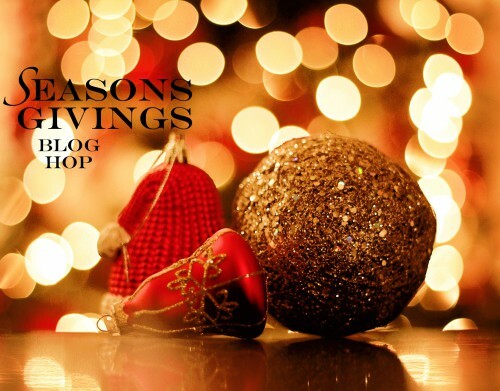 We’re thrilled to be a part of the 7th year of the Seasons Givings Blog Hop! Each participating company and designer offers an opportunity to win a prize. This way companies and designers thank our followers for their support. You’ll find an inspiring project on each blog too. Start the New Year with a creative bang! Don’t forget to pin your favorite projects, and follow some new companies and designers! Who doesn’t love a party to ring in a New Year?! Today Linsey Rickett shares a party ensemble that is sure to inspire to make a party of your own! Also, read all the way to the end for our giveaway details! 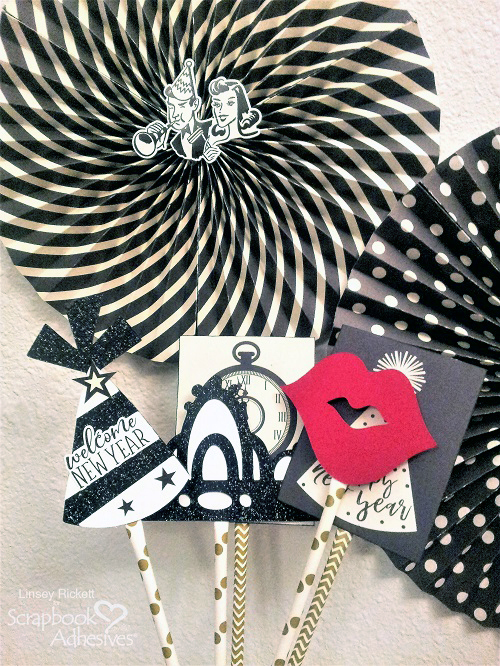 Ring in the New Year with festive party decorations! 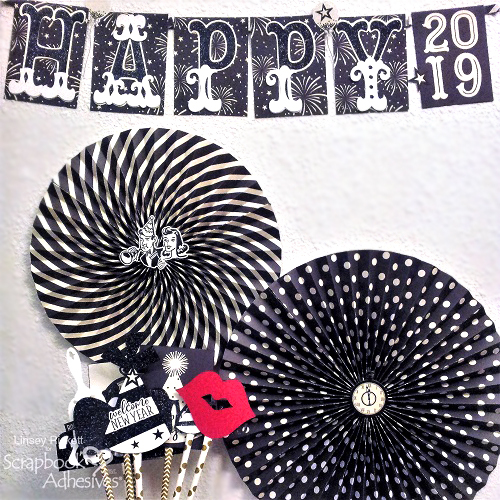 My party ensemble consists of beautiful large rosette pinwheels, a new years banner and a collection of fun photo booth props! A ‘Happy 2019’ banner is sure to set off your New Years display! I cut five rectangles out of patterned paper and one out of black cardstock. Simply add letters and numbers with the E-Z Runner® Permanent Strips Dispenser. Accents were added with Adhesives Dot Medium. Rosette pinwheels are easy to make and add pizazz! I simply accordion-fold several sheets of patterned papers and assembled the ends with E-Z Runner® Permanent Strips Dispenser. To finish it off, I added a die cut in the center using an Adhesives Dot Medium. A photo booth is a must for any party these days and of course, you’ve got to have all the props to go with it! Make fun photo booth props with paper straws and die cuts. I assembled all the pieces with a combination of E-Z Runner® Permanent Strips Dispenser and Adhesives Dot Medium. What will you be creating for the New Year? 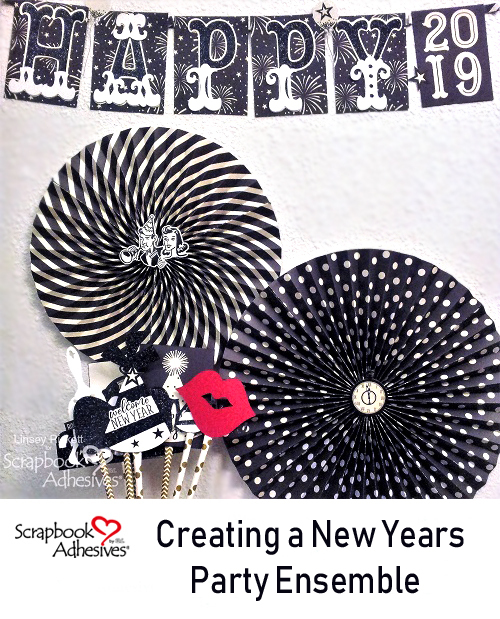 On behalf of Scrapbook Adhesives by 3L® and me, thank you for your support this year and we wish you a Happy 2019!! Enter to win through the Rafflecopter App. Comments are monitored and will take time to publish. International entries are welcome. If you cannot see the comment section (at the bottom of this post), please click: Seasons Givings 2019: New Years Party Ensemble, and scroll down to the bottom of the post. Visit our Website and follow our Blog! Scrapbook Adhesives by 3L – You are here! This entry was posted in Adhesives, Announcement, Beginner, Crafts & Tutorials, E-Z Runner® Dispensers, Party Favors, Permanent Adhesive, Seasonal Craft Ideas, Skill Level, Winter and tagged 3D Foam Circles Black Mix, Adhesive Dots Medium, Banner, Blog Hop, E-Z Runner Permanent Strips, E-Z Runner Permanent Strips Refill, E-Z Runner Permanent Strips Refillable, E-Z Runner Permanent Strips Refillable Value Pack, Giveaway, Linsey Rickett, New Years, Party, Party Decoration, Party Favor, Seasons Givings. Bookmark the permalink. ← Your Favorite Projects from 2018! 343 Responses to "Seasons Givings 2019: New Years Party Ensemble"
Great party favors. I like the rich colors and wonderful designs. Happy New Year. Photo Booths are so fun and the party favors are so pretty! Happy New Year!, ? Wish I was at a party with all those wonderful creations made by the designers at Scrapbook Adhesives. Love those large rosettes! My first projects of the new year will be a couple of Winter themed cards for a few people I didn’t get to see over the holidays. I can’t wait to get back into my craft room! I wil! Be working on a scrapbook. Great projects! Thanks for being part of the hop. My first crafty project of 2019 will be thank you cards for the Christmas gifts I received. Looking forward to getting started on them! Any excuse to play. I’ll most likely make a card! Birthday…. always love making cards! Happy New Year. My first card I will make is thank you cards. Thanks for th great party favor and props ideas. Lindsey, this is so FUN!!!! First crafty project will be working with Reverse Confetti and of course, my adhesive of choice, Scrapbook Adhesives by 3L! Happy New Year! I love the colors and the lettering on the banner! SO pretty! Happy 2019!!! I have birthday cards to make and start on Valentine treat boxes for my granddaughters. My first project will be a birthday card for my granddaughter, should have a unicorn theme. What fun party props for the New Year! I want to try using an alcohol lift-ink techniques first. These are so cool! Especially love the photo props. Super cool party favors!! What would we do without adhesives???? Probably the first thing I’ll make this year are some high-end Valentine’s to sell in our local art store. I’ll be making cards for my volunteer gig as a Chemo Angel … like to have lots of cards on hand to bring smiles to people going through that rough time in their lives. I am still making Christmas cards & tags for next year. This is my fave time of the year to make them as I am brimming over with inspiration from the past month or two, it has become one of my fave traditions! My 1st project of the new year will be the Make it Monday challenge at Papertrey Ink. Happy New Year to you and thank you for offering such a terrific prize. Cheers. Oh what fun a photo booth with all the props would be. I’m going to hopefully be creating more cards that have matching dies. My 1st project for 2019 will be the January page of my wall calendar. Thanks for the chance to win and Happy new year to your team and readers! Sadly I made nothing for the new year and slept right though it. I would love to do a photo booth though and have great props for it…perhaps my son’s graduation party. Wonder if he’d go for it???? Happy New Year! Thank you for the opportunity! Happy New Year! My first project for the new year is a layout for a new year challenge! I will be making a birthday card for my dad. I love paper-crafting. Your design ideas are so cute! Happy New Year to everyone!!! My first crafty project of 2019 will be a couple of Birthday cards. Love these party ideas!!! My first projects of the new year will be birthday cards for my granddaughter. She is not local to me so I like to send her multiple cards as one of her “self appointed” jobs is to bring in the mail. She recognizes HER name on the envelopes!!! These are wonderful! Love the patterns and textures – will use this idea next year for sure. My first project will be thank you cards. My fist projects of the new year will be valentine cards. My first project for 2019 will be cards made with my new Christmas goodies. My first project of the new year will be Valentine cards for my upcoming card making class with the seniors. First crafty project is a nautical card! thanks for the chance to win! Oh my goodness, I have two going right now and I will finish them both in the next week: a set of note cards for a dear friend, and a gift for my husband. I just love those giant pinwheels so I have to try and make some. But my main focus is to scrap the 200 plus photos that date back from before my great grandparents came to this country. I collected all these photos when I did an album for my grandmother. This album told the story of my grandmother’s life, from her birth in Poland till the day I gave her the album. I also had every immediate family member to either write something or possibly make a layout about their family. I put those items in the back. I presented the album the day of the party. Our family all managed to come and we celebrated this great lady’s 95th birthday. Well now I have all these extra photos of my family from days gone by and I feel I must preserve them so my grandchildren and their grandchildren will all know the generations that we all come from. It’s aa massive job but I think I can do it! My first order of business is to start working on Valentine Day cards for my friends and family. My first crafty project for 2019 is a gift for my mom. Her birthday us early February and I am working on a Putz-style house for her! 🙂 Thanks for the chance to win! Fun idea! And easily applicabile to all holidays and birthday themes!! Happy New Year! My first crafty project of 2019 will be December thank you cards. My first project is to make my son a Birthday Card. My first crafty project of 2019 will be starting my granddaughter’s album. Since I did not go to a New Year’s Eve party, I started prepping some pictures so I can get started on a couple of pages today. Does cleaning the Christmas mess off my desk count as my first crafty project? LOL! Aside fro that, I will be making some cards this week, for sure! Unfortunately my fist project in the new year is a sympathy card. Not how I wanted to start off the year. My first crafty project is not papercrafting, but I am crocheting a prayer shawl. My first crafty project of 2019 will be an album for my niece’s 1st birthday. My first project will be the first challenge that excites me! Wow! What a fantastic group on the hop and I love these party favors! I am planning on getting crafty on Sunday! It’s going to be getting started on my Valentine’s day cards! Thanks for the chance! My first project of the new year is to finish three projects that I started before the festive cards & are sitting waiting for me. Two are for My daughter & one for friends daughter & deserve to be fully loved before I start anything else. Thank you for being part of this fun hop. Love your chic party ensemble! Thanks for sponsoring this fun hop – I love my Scrapbook adhesives by 3L and can always used more!! My first crafty project for 2019 will actually be a Christmas card! A crafty friend and I are holding each other accountable to a promise to make one a week for 2019 so we’re all set when December arrives. Thanks so much for the inspiration… what fun and awesome decor projects!! Happy New Year, my first crafty project will be finishing a knitted scarf for my daughter. I am going to dive into shaker cards!!!!! Mine first crafty project will be a. card of course. I have a colored bear in an airplane on my desk that I’m pondering making a slider card with! Great fun and inspiration for new years. Have lots of projects planned for this year. My first crafty project will be a thinking of you card for my neighbor. Great ideas! Thanks for the chance to win! Happy New Year everyone. I’m going to make interactive Valentine’s Day cards for all the grandchildren. I’ll be making a “first year scrapbook” for my second grandson. My first project will be birthday cards to use throughout the year. Great projects. Love the colour choices. Party time and super cute decorations! My first crafty project in 2019 will be a heart-themed card! Thank you for the awesome giveaway! I love your fun and festive ideas! Thanks so much for being a part of the Seasons Givings hop! Happy New Year! My first crafty project to do is make my daughter a card for her first day in a Nursing program which she starts on January 7th. She’s nervous so I hope to make her day brighter knowing I’m wishing her luck? Happy New Year! Thanks for the chance to win. My first project will be finishing my 2017 scrapbook and starting 2018 album, then making Valentine’s cards. What a fun and playful party ensemble! My first project will be thank you cards for Christmas. My first crafty project will be birthday cards. I have a few birthdays coming up in January and February. My first crafty project was a two cards made as contributions to the Scandinavian cardmaking and scrapbooking magazine Ett Trykk. I love your products I’ve never made a single card where I didn’t need adhesive. My first project is going to be some more New Year’s Eve cards what can I say ? Fantastic party ensemble! Love the black and white!! love the inspiration, my first one this year will be something to do with my brand new granddaughter. Fun party props! I have so many crafty goals for 2019! Make more cards to donate, work on my blog, and start on my daughter’s graduation scrapbook. Lots to do! Happy New Year! I love your product and craft ideas! I plan to work on building up my stash of thank you cards and sympathy cards. Fabulous decorations! My first project is making beaded snowflake ornaments for my own tree (as opposed to gifts for others) and first paper crafting project likely will be a birthday card for a friend! Beautiful creations! I need to make a lot of cards this year for charities. My new crafty goals for 2019 is to practice more unique backgrounds for my stamp sets , stretching my stamp sets as far as I can ? . My first project will be coasters for my nephew’s new furniture. You have a great project here, so fun! Happy New Year! My first project this year will probably be a valentines card! What awesome projects! Thanks for sharing and for the wonderful inspiration! Thanks too for this giveaway the the opportunity to win! Those are some beautiful designs, love them. Happy New Year and God Bless! Happy New Year!! What stunning party projects!! Birthday cards are on top of my to create list. My first crafty project of 2019 will be to clean up the mess I made finishing my Christmas cards! Plan to attack my vinyl stash and make signs, r shirts and mugs. these are such fun party creations – i’m going to try to make Christmas cards so I’ll be ready for this coming holiday. My first crafty project will to get caught up with my scrapbooking! I have a few ideas for pages I’d like to complete. My first project of the year is a Chinese New Year card for my daughter-in-law. I love your foam squares!! It will be a thank you card! Lots of those to make! Such cute & creative party decor! Love when paper crafting supplies are used to make home decor! My first project of 2019 will be a birthday card for my daughter! I’ve already made my first crafty project for 2019 – a cute card for my niece. Thanks for the chance to win! I’ve got some Design Team creations I have to finish up – I’m a bit behind with all the holiday hooplah! Fun projects! My first crafty project this year is a scrapbook page, it’s a challenge piece for a papercraft club. I will be working on all my cards for 2020, which include birthday, anniversary etc. I have 3 birthday cards I have to finish up for 2019 which thankfully are for the end of 2019. Great ideas! My first crafty project for this year is to make birthday gift tags to give away. My first project will be birthday cards! I have THREE January birthdays! My first crafty project will be a Valentines Day card. Happy New Year! My first crafty project I am planning is a Disney album! I can’t wait to get started! My first crafty project this year will be to play with my Cricut. My second grandson turns 5 in January so I have a special card planned to make for him! After that I look forward to playing with some foils and my new laminator. Happy New Year. I hope it’s a crafty one for sure. Happy New Year! Making some Mason jar lid covers for a neighbour will be my 1st crafty project of 2019. I love the photo booth props and pinwheels. Thank you for the chance to win your awesome prize. My first project will be making a birthday card. Making Valentine Cards’ Love the New Years Decorations! Happy new year. Such a fun project. Thanks for the inspiration. I love the party favors. My first crafting projects (2 birthday cards for friends) have already been made as currently on summer holidays here so I actually have time. My 1st project is a Gratitude letter to my sister in a card and a page for my new 2019 scrapbook. Thanks for sharing this great giveaway. My first crafty project for 2019 is finishing a couple scrapbook pages that I started in 2018! My first 2019 project is going to be a Christmas card! lol Yep, I make them all year long so that I have a lot to give to family, friends and charities. Thanks for the awesome giveaway and Happy New Year! My 1st project in 2019 is scrapping all of my Christmas photos using my EZ tape runner of course. Thanks for the great prizes! I’m going to spend more time crafting in 2019. Spent 2018 emptying out 65 years of stuff from my Mom’s house. My first project will be a springtime card. My first craft for 2019 is birthday cards! I’m always scrambling to make birthday cards last-minute, but now I’m trying to get ahead of the game. My first crafty project is a birthday card for a dear friend of 30+ years. Super cool party decorations. My first project for 2019 will be a card set for a friend’s birthday. My first project will be a set of note cards as a thank you for an unexpected gift! My first project of 2019 will be Valentines Day cards to sell on my Etsy shop! My first craft project is Valentine’s Day cards…..love that holiday! My first crafting project will be a thank card for a colleague for a Christmas gift. I will be making cards for all my friends…birthdays, anniversaries etc. My first project is to clean my craft table and then I’m going to get busy making birthday cards and building up my stash. My main goal for 2019, always more cards, sharing and optimization! Thank you for giving us the chance to win this fabulous prize! I will be making a birthday card for a friend who has a January birthday. thanks for the chance to win. My first project is a Congrats card for a friend expecting their first child. I’ve been working on card making kits all day today. I love to help people feel like they can be creative and make something handmade too. My first project was to create some thank you cards! I am still working on Christmas cards. I am making a bunch, some to give away and some to save for the upcoming. Happy New Year all! My first crafty project will be to finish a travel journal for a friend. My first project will definitely be some cards. Thanks for the chance to win! My first project will be completing some scrapbook layouts at a 3 day crop in January! What fun ideas!! My first project for the new year is Valentine’s Day cards. First project this year, will be my daughters birthday card, Happy New Year!! My first crafty project for 2019 will most likely be a card. Love the rosettes in the New Year’s Party Ensemble. My first crafty project of 2019 will be getting out a couple of New Years cards to a few people I missed at Christmas time. Then I will be randomly picking stamp sets to create a stash. need to finish my 2018 cards ….. Happy New Year! Great party favors! My grandchildren are still visiting so we made a 2019 banner, a party hat on a headband and covered and decorated notebooks. My first crafty project will be a Christmas card. I didn’t have enough handmade cards to give to everyone this past Christmas, so I need to do better this year. What a fun party set. Happy 2019. Thanks for the chance to win. Super cute ideas!!! I know good solid adhesive is needed for these party favors.! these remind me of the “old” days when psycadelic was in. gorgeous. Creating some thank you cards will be my first crafty project this year. Nice photo booth ideas. Will have to share with my daughter as she always has a photo booth at her parties and sometimes just get togethers. Fun idea! My first project will be to make my hubby a birthday card. Fun project! Not sure what my first project of the new year will be . . .
My first project is going to be an album from Heartfelt Creations. Happy New Year! My first crafty projects I urgently need to do tonight will be a ‘Thinking Of You’ card paired with a big bag of wrapped chocolates to help someone get through their work day tomorrow as they just put their mother in hospice care. I will also be making a card to send to someone I didn’t get to with my Christmas cards, so will make a nice wintry scene with Happy New Year written inside. My first project for 2019 is a birthday card for my son whose birthday is January 5th…so I have to get on it! LOL! Maybe I’ll do a celebration theme. My first crafty projects will be creating layouts using my January kit from The Wild Hare Kits! My first crafty project for 2019 will be my planner. I will be making cards for upcoming birthdays. I am going to make Happy New Years cards for all of my friends. My first project of 2019 will be my sister’s birthday card. I am going to make a birthday card for my little sister. My first crafty project is Holiday thank you cards. Next is Birthday shadow boxes. I am also continuing my calendars, that a I could not complete all 12 months by Christmas….so I gave Jan, Feb & Mar. Lots of projects ahead! My first project will be birthday cards for my sisters! Happy New Year! My first project for 2019 will be birthday cards for my son and daughter-in-law. I’m looking forward to spending more time crafting. Love the party decorations! I made party decorations for both of my granddaughters this year. My first project for 2019 has been a Valentine card! Project first is to organize my newly remodeled (almost finished) studio. Let’s face it, organizing is something most of us love to do anyway, its a craft in itself. Otherwise, cards for next Christmas before Easter so I won’t have that to worry about next season. Happy New Year everyone. Of all my potential craft projects, my first one is to be better organized. (Does that count?) Otherwise, I intend to make some art for my home, some cards to actually send out to friends and family, and just having fun with the family in our arts & crafts studio. I’ve got so many birthday cards on the go – also looking forward to starting eaters projects hehe! My first project will be birthday cards. One for my mother in law and cards for my students. My first crafty project will be a birthday card for a co-worker, whose birthday is on Jan 6th. Thanks for the chance! My first project of 2019 will be thank you notes for Christmas gifts. I’m a guest designer for a stamp company–so excited–so those projects are my first of 2019. Thanks for such great prizes! My first will be Thank You notes followed by Valentines! When I first scrapbooked 20 years ago, I started with 3L adhesive! Great product! My first creation will be greeting cards. Birthday Cards. I have a bunch of family members with birthdays in January. My first project of the New Year is a birthday card for a family member who is celebrating a significant birthday in just a few weeks. My first crafty project of 2019 will be making Valentine cards and decorations. Wow, you can never have too many different types of adhesive! I am still putting together winter greeting cards for when I go back to school to give fellow teachers because I fell behind before the holidays! Love your products! My first project for 2019 will likely be a card. I’d like to make cards for random (and obscure) holidays over the coming year, instead of just crafting up a storm at Christmas. Love these festive decorations! My first project for 2019…. some thank you cards! I want to wish everyone a happy and healthy new year, filled with much creativity! I’ve already done my first project… an mandala birthday card! My first project will be a card for my daughter who left for college today. My first project will be to get my craft room cleaned up. Then I will make something with the kids while they are home on winter break. Love the Rosettes. My first project for 2019 is Valentine’s Day cards for my family. Thank you cards need to be made to thank people for their holiday gifts. Happy New Year!!! Thank you for the chance to win!!! My projecto for 2019 is to make more cards! Happy New Year. The striped pinwheel is especially cool. Kind of an optical illusion. Next up I need to make some valentines and birthday cards. Love the black and white decorations! My first crafty project is to use my brand new Cricut to make a framed goal list for 2019! My goals for 2019 are to be a better person through my crafts. It’s important to give back to people and to improve yourself. I plan to make and donate my extra cards to my local retirement home during the year. Thank you! I just appreciate this 3-D project. It is wonderful that all of you are thinking of us. I appreciate all the innovate product that I see on the blog hops! Hi, I am going to try to get back into Scrapbooking, I am sooo behind in that because I have been hooked on making cards and crafts and home décor, I feel terrible, I really have hundreds and hundreds of photos that need to go into scrap books, so that is what I am going to start doing a lot more of, I really enjoy it and I think I forgot how much I enjoyed it. Thank you for the chance to win, I have followed you on all the social medias for years, love you all, Happy New Year!!!!! FUN & FABULOUS party decor! My first project will be birthday cards–one for my mother in law and some for my students. Scrapbook Adhesives have some of the BEST ideas for crafters as well as THE BEST adhesives to use. I love your products! Thanks fo the chance to win! I really love those photo booth props! My nephews birthday party invitations and shirts! I’ve already started Valentine’s cards. Then I’m planning on making all the birthday cards I need for 2019. My first project of 2019 will be beginning a Christmas tag swap for the year! Thanks for sharing the rosette project! I love them. Love the party favors! My first crafty project will be a card. My first project is going to be new baby cards. My friend has a few greats coming in the next few months. My first crafty project for 2019 is, sadly, a sympathy card for a dear friend. I also intend to give my craft space some much-needed organization. My first project will be ATC cards for two different swaps ? I love your adhesives! Thank you. My First Project was DT Projects!! I’m BUSY creating for the Month of January and having a BLAST!! THANKS for sharing and for the chances to WIN!! Have a FABULOUS WEEK!! What fun photo booth props! Thanks for the inspiration! and the chances to win! My first crafty project will be a chore chart for my kids! I want to help them have better work ethic and routines. My first project for 2019 will be cards using some of the new craft goodies I got at Christmas! I love your products! Only foam squares I use. Love your products and use them all the time! Thanks for the wonderful prize we could win! My first crafty project of 2019 is already done, and given away! I made up a boxed tin full of card blanks, stamped card bases, stamped and colored die cut bits, binder clips, batteries, conductive copper tape, and LED chip lights so my nephews can make paper circuit gifts/light-up cards with their parents . I will be working on Valentine cards for my card ministry. Love these ideas! Thanks for the chance to win! A birthday card for my wonderful granddaughter who is turning 20 this year! My first project will be a foiled card. I look forward to trying out the laminator and foils that I received for Christmas. My first crafty project will be decorating my bullet journal. My first project will be putting all my products I bought in December away to their home in my craft area. I love the beautiful rosettes for the New Year’s celebration. My first project will be a birthday card this week! My first plan for the new year is to get organized and hopefully stay that way. What great New Year projects! I will be making a card for a couple of challenges. I am currently working on some monoprint thank you cards!!! I absolutely adore the rosettes you created!!! They are gorgeous!!! My next project will be Valentine Cards for all my little loves . . a.k.a. my grandchildren. Love the photo booth props. We love using props at party events. Happy New Year! My first crafty projects of the year are Christmas thank you cards. My first project for the New Year is to tidy my craftroom….might take a week to do it but one card-making session to undo it! Thank you for this great opportunity and the great inspiration. For my first project, I started playing with the Happy Campers trio set from Art Impressions. I bought it back in September and just now getting a chance to play with it. My first project is a birthday card for one of my besties! Love the banner! for my first project, I will make a mini Christmas album with photos from our family get together and my day trip to NY with my oldest daughter. Lovely ideas! Thanks for the chance to win! Love the party favors. My first project f 2019 is thank you cards, Sadly sympathy cards as well. Thanks so much for this giveaway. Lots of fun stuff. Thanks for the chance to win! I think my first project will be some lovey-dovey cards for my family. Wow,, Linsey has done a bang up job with her New Year’s celebration goodness, here! Love it! So creative and clever! Next up, I am working on Valentines cards for the patients at a local Alzheimers facility. Happy New Year. My next project will be masculine birthday card. Clean my craft room and label as I go. Happy New Year! Wonderful projects & great idea for homemade striped paper! Thanks. First project will be to make a New Years card to someone, as time ran out on me before Christmas, and try to find a place to put everything away. I also have a box or 2 of projects and images that I need to dig out and use up and make a batch of cards to send out as RAK’s. My first project of 2019 will be creating a birthday card for my sister, Melanee! My first project was a sympathy card, thank yous and now a new baby to welcome! Been using my tape runner, dimensional tapes, and glue! Thank you for sponsoring the Seasons’ Giving Blop Hop! The photo booth is great inspiration for a holiday party or party of any kind really! Label all my stamps by category, huge task but will get to doing them all in order. My first project wasn’t making anything, but I started organizing and labeling my stamps. I have a LOT and this will take me a long time to complete. I will be SO happy though when it’s done. Thanks for a chance to win! My goal is to get my craft products better organized so I can make more things. My next projects will be making birthday cards for my twin boys at the end of this month. Thank you for the inspiration! Happy New Year! My first project will be Valentine’s Day cards for my daughter’s classmates. My first project will be to get my Italy vacation photos printed and in a scrapbook! And equally as fun…finish my December Daily. Well, my first project will be organizing my crafty stash. But the first actual project that I will start will be a cross stitch Christmas stocking for my nephew – I made one for my niece in 2018 so it’s his turn in 2019. Happy New Year! My first project is to finish organizing my craft room so I can make cards and scrapbook! I guess my first project will be a valentines card for my grand daughter! Thanks for all the beautiful ideas. My first project is to organize my craft room. I’m hoping to get started on a baby quilt! What a fantastic giveaway! All crafting needs adhesive. Happy New Year and thanks for the opportunity to win. Super cute projects – love your adhesives!!!! My first project is to create a snowman shelf sitter for my warm weather cousin. I love that Linsey used straws instead of a wooden stick for the photo booth props. Wow, these are great. I would try to make these for the coming new year. I have also made a new year card and given to a friend in the new year. My first project is to complete the projects I was going to give for christmas gifts, wedding photo mixed media photos on canvas. Love this project too! I would like to start by making cards for any occasions. Something that I just have to add a sentiment and sent it on its way. My first crafty project will be…belated Christmas presents. *facepalm* I wish I could say this was uncommon, but it’s really not. Thanks for the chance to win! Wow ..I always love the idea of photo booth…my first crafty project will be a Thank you card for all my friends and followers.. I love the photo booth idea, something that I would incorporate into my next event. I am proud to say that I completed two Happy New Year card! I’ll be starting with easter cards this weekend. One of my crafting goals for 2019 – be prepared! Thanks so much for such a wonderful hop, and for a chance to win such a great prize! Happy New Year! My first project of 2019 was a birthday card. Thanks for the opportunity to win and this amazing hop. Happy New Year! I love these bold, fun decorations! Scrapbook Adhesives definitely handled this job very easily!!! Thanks so much for the chance to win! Who doesn’t need MORE…MORE… and MORE adhesives!! My first crafty project of 2019 is a home decor piece, a snowman, I need some cute winter decorations! Most likely a scrapbook layout about my son’s wrestling! The first thing will be finishing my Dec. Daily album. My first crafty project is finishing my Lawnfawnatics card. Love this! My first crafty project is to make some bookmarks for my daughter’s class. Thanks for the chance to win! These look great! I’m loving those rosettes. I wanted to make some for a baby shower but wasn’t sure what size paper to use. Thanks for sharing. Rosettes are so much fun to make and the photo props are just fab. Love the palette of your ensemble. My first projects of the year are valentine cards. My first projects are gift baskets for my kids’ school auction along with decorated wine bottles for a wine tasting event. Love your products! Thanks for the chance to win. My first project will likely be a card for a random occasion. I already started on Valentines! I am working on a paper crafted calendar for a friend. Fingers crossed that I finish soon! My first crafty thing was to work on more Christmas cards with sets I had purchased but not used yet. Getting a head start for next year. I love those projects you made too. They are fantastic! Cute ensemble! I, especially, love the photo props!! For the new year I plan to make and send cards of encouragement every week. Happy New Year! What a great party ensemble! My first crafty project for 2019 is a birthday card for my husband. 🙂 Thanks for the chance to win! What amazing party projects! My first 2019 projects will be cards using my new Christmas presents! My first project is to finish a pallet sign I started during the holidays! Photo props are the best. My daughter runs a daycare and the kids always look forward to fun stuff and the parents love the phots. I have a Cricut and this is my new job in crafting items for the kids.